Some soil erosion is natural, but accelerated erosion is not. Erosion reduces the productivity of ag soils, plugs road ditches, carries pollutants into streams, and clogs fish habitat. It pays economically and environmentally to keep soil in place. Most Oregon soils begin to lose productivity when they erode more than 5 tons of soil per acre each year. This usually occurs through a process called sheet erosion, the gradual loss of a thin layer or “sheet” of soil. Since 10 tons of soil lost per acre equals the thickness of a dime, sheet erosion can be very hard to see. Small rills or gullies begin to show. Cloudy or muddy water flows down the field, road, or driveway. because the surrounding soil has been eroded away. Sediment builds up at low spots in the field. Streams and rivers run cloudy after a rain. Streambanks crumble and fall into the stream. One conservation practice does not fit every erosion problem. Your soils, climate, topography, and cropping system will require a unique set of measures. We can provide technical assistance to help you prevent erosion. Request a site visit or give us a call. Filter strips and buffers slow water speed, filter pollutants, and trap sediment. They can be used to stop sediment from leaving the farm. Grass filter strips are effective on slopes less than 10 percent. Riparian buffers of native trees and shrubs protect streams and may be 40 to 300 feet wide, based on site conditions and stream width. Grassed waterways are flat-bottomed channels planted with grass that are designed to slow water down to prevent gulley formation. Farm equipment can drive over the side slopes during the dry season. Waterways may need to be combined with rock linings or drop structures on steep slopes. Conservation tillage reduces the amount of tillage and leaves at least 30 percent cover from crop residue after harvest and during winter months. Soil loss is reduced by 50 percent compared to bare soil. Contour farming runs rows “on the level” perpendicular rather than up and down the slope. Crop rows form hundreds of small dams that slow water and reduce soil loss up to 50 percent. Cover crops temporarily protect the soil until the main crop is planted. Cover crops also add organic matter and reduce weed growth. Plant cereal grains and legumes for winter cover crops. Buckwheat is a good summer cover crop. Pasture management balances livestock numbers, forage, and water for a healthy farm income and environment. Pastures with at least 70 percent plant cover have little erosion and produce more forage. Set aside a “heavy use area” where animals are held to protect pastures when soils are wet or plants are recovering from grazing. For more information, see the Horses and Livestock section. Erosion problems? Contact us for a free site visit! 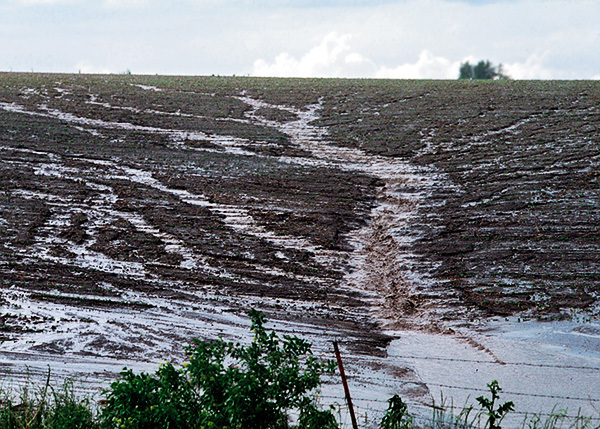 If you’re experiencing erosion issues on your land, EMSWCD can help! We offer free technical assistance for erosion and other issues in rural areas of our District (our District is comprised of all Multnomah County east of the Willamette River).